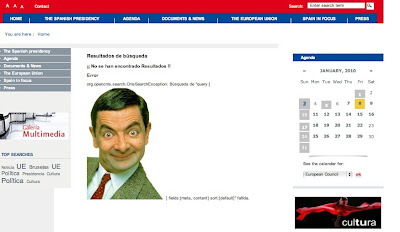 The Spanish Government has announced it will investigate the hacker incident which saw a picture of Mr Bean hung on its European Presidency website during a number of hours on Monday. The photo was intended as a reference to the oft-noted resemblance between Spain's president, José Luis Rodríguez Zapatero, and the comic character created by British actor Rowan Atkinson. The official Spanish Governmental residence, Moncloa, described the sabotage as "minor" and said the incursion had been rectified, although until 2.30 pm GMT on Monday it was impossible to access the site. NY Jets Advance to Playoffs!